I am writing this newsletter from Cape Town, where there has been a major issue regarding the removal of the statue of Cecil John Rhodes from the grounds of the University of Cape Town. Rhodes is seen by radicals as a colonialist who brought terrible hardship to Africa. The statue of Paul Kruger in Church Square, Pretoria, was given a splattering of green paint. 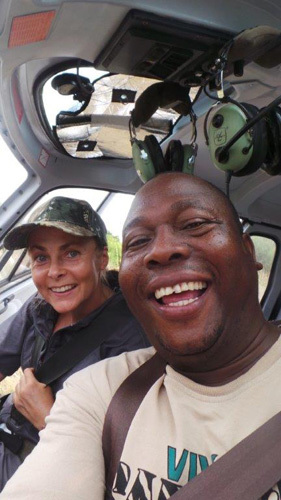 I wonder if they are crazy enough to want to rename the Kruger National Park – it could be quite entertaining ! 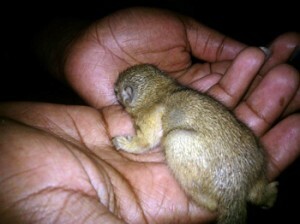 When I went to visit the offices of one of our Cape Town agents, I saw a Grey Squirrel in the garden. It is not commonly known that this species of squirrel is native to North America and was introduced to the Cape Town area by Cecil Rhodes. I have written in previous newsletters about the dangers of introducing alien species. Fish such as the common Carp and birds such as the Indian Myna have done much damage to the local fish and bird populations. Another such introduced species is the Mallard Duck. 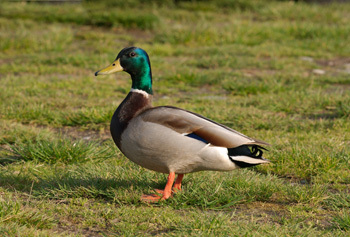 Originally from Europe, the Mallard was a popular species to keep among the well-to-do mainly because of the beautiful metallic sheen of the drakes. What is of concern to South African bird lovers is that the Mallard has recently spread from private dams to numerous dams and pans across South Africa. The problem with this species, unlike the Indian Myna, is that it interbreeds with local indigenous ducks such as the Yellow-billed Duck (Anas Undulata) and the African Black Duck (Anas Sparsa). What is even more scary is that the hybrids are fertile – meaning that they can breed, thus ensuring that the genetic purity of our duck species is further compromised. There are people who will see any form of eradication of these hybrids as something akin to xenophobic attacks on other Africans in our country. There are others who will point out that it is inevitable that interbreeding will occur naturally. My take is that we need to ensure that we limit the occasion for interbreeding. Just as we at Viva Safaris subscribe to the strict enforcement of rules regarding feral cats not being allowed any access to game reserves ( where they can interbreed with the African Wild Cat ), we believe that all alien species, including Mallard Ducks and Indian Mynas MUST be eradicated from game reserves. After all, one of the fundamental tenets of conservation must be to preserve, in unadulterated form, all the naturally-occurring fauna and flora in our reserves to which we have become custodians. We would be failing in our responsibilities as conservationists if we fail to attend to this. Tremisana Dam is daily attracting different types of animals like Elephants, Impala, Zebra, Buffaloes and Kudu. They visit the dam every day, because this year it has not rained a lot and the natural waterholes are dry. We always find some animals drinking water and taking a bath or wallowing in the mud especially Elephants, Warthog and Buffaloes. I was watching a few herons and storks drinking water and looking for small fish in the shallows of Tremisana Dam and later a few elephant bulls come to join as well. One elephant went in the middle of dam and started swimming in the water to cool down. During the Bushwalk we found fresh spoor of elephants moving away from the Olifants river into dense bush – it was little bit difficult to follow but we tried our best to make our guests happy and enjoy the bushwalk. It took us almost one hour to get to where they were feeding and we managed to get close enough to take beautiful pictures. It was a relaxed and awesome sighting. Along the river we spotted two fish eagles hunting catfish. One of them managed to hook its talons into a catfish, but it was too big for eagle to fly away with. The eagle dragged the catfish to the river bank and started feeding and the other eagle came to join in. A small crocodile come out of the water and tried to take the fish from the eagles, but the eagles saw the croc and moved the fish away from the river. On our way back to Tremisana Lodge we came across two black rhinos feeding along the road and blocking us to drive through – it took us about half an hour ! The baby was busy playing in mud in small pool on the road and its mother kept an eye on us to ensure her baby’s safety. Full day Kruger National Park. Our first sighting was of two big male lions asleep next to road on S106. Further on, we spotted four hyenas carrying a zebra leg and moving very fast towards their den. One of them was making a noise like laughing and that is where they get the name “Laughing Hyena”. Nsemani dam was busy with lots of animals drinking and taking a bath. Five elephants were swimming and playing in the water for almost an hour. A herd of buffalos come down as well. Then there was great excitement : before they reached the dam some lions moved out of the bush and got ready to attack. The huge buffalo bulls charged with great enthusiasm and chased the lions away from the dam and then come back to drink. Near Girivani we had a good close sighting of two White Rhinos sleeping and red-billed oxpecker busy eating ticks. For guests doing the 5 or 6 day Tremisana Lodge Safari, we offer a fantastic Champagne Breakfast. We drive along the Olifants River and even let the guests choose where they want us to set up the picnic table and chairs ! On the way to the Olifants River, we visited Tremisana dam early in the morning we only spotted two buffaloes feeding around the dam and few water birds like Grey Heron and Blacksmith Plover. I switched off the engine to listen what is going on around us and we heard loud calls coming from the East- it was a male lion roaring early in the morning reminding all herbivores that the king is alive and active. 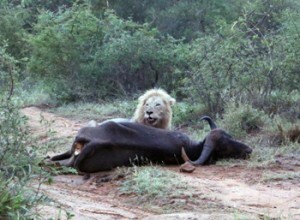 We moved in the direction where we heard the lion roaring and we found it eating a buffalo right on the road. It was very close and great to see lion so early in the morning feeding and roaring in front of us. It tried to pull a carcass away from the road but it was too heavy. The guests had a very good reason to toast their great luck at the Champagne Breakfast ! The beauty of the Kruger is not knowing what might appear from behind the next bush – it could be just another impala or maybe an elusive leopard. The search for the big five is often top priority when in the Kruger, and when you manage to find them all in one day it’s a great feeling. It was one of these days that stands out as a highlight – just a perfect day. We entered through Orpen, the gateway to central Kruger. The sky was blue – not a cloud in sight, a beautiful summer day in Africa. The ever present herds of blue wildebeest and zebra greeted us on entrance, often grazing together along with their good friends the impala. 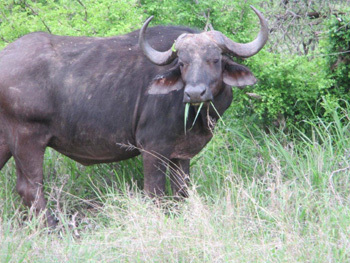 The first big five sighting happened to be rather large buffalo. He had obviously been lying in the mud, his tummy had a thick layer of mud, as did his horns. We call these ones dugga boys, meaning mud boys. They are the old males who just can’t keep up with the breeding herds, and tend to be very grumpy with life. We kept on searching and came across a flock of Southern Ground Hornbills, not a big five sighting but nevertheless a very interesting bird. They are most often seen walking around searching for things to eat, tortoises being one of their favourites. They happen to be long lived birds and only mature sexually after six years. This means it takes long periods of time for them to increase in number. They luckily have the Kruger as a safe haven to increase these numbers. The elephants one of my favourites happened to be our next box ticked. A large breeding herd had just been down to the river for a morning drink – we caught them on their way to feed. The big matriarch trumpeted and they all began to move away from the water, the youngsters all clinging to their mothers side, some of them only about a month old. We sat and watched as they all crossed the road in front of us – it’s then that you realize how small you really are. It was time for lunch, we stopped and enjoyed a good meal at Satara rest camp. We still needed to find those lions, rhino and leopard. I got a few helpful tips from my fellow guides and off we went once again. It didn’t take long before we noticed a small traffic jam up ahead – we crept towards the vehicles, and there lying next to the road was a lion. He had found a shady spot under a small tree, and most likely hadn’t moved all day. On closer observation we noticed a second set of ears, lying alongside his large body, it was the female. The scene became more exciting when another male appeared on the scene. He clearly wasn’t looking for a confrontation as he kept a wide berth between himself and the other male, moved past and lay down in the shade of another tree. The two males were most likely in a coalition together, the one with the female being the dominant one. A great lion sighting but we were still missing the leopard and the rhino. The afternoon heat began to dwindle as the sun headed down towards the horizon, the big herds of buffalo began to move out from under the trees and head for the watering holes, and so did the elephants. We were running out of time, and still no rhino or leopard, but thankfully this was about to change. I took a quick detour down towards a waterhole as I felt this would be our best chance at finding a rhino. The first thing we saw was a huge herd of elephants in the river bed, as well as a few lonely buffalo, then we noticed a very unsure rhino standing in the background. He seemed very disturbed by the fact that so many animals had decided to drink from his waterhole – he just stood there flicking his ears and looking around nervously. He had already been for a drink, his mouth was still dripping with water, an amazing sighting. The rhino box was finally ticked. It was now time to head straight for the gate, with only time to stop for something amazing, like a leopard. The sun was starting to set over the Drakensberg mountains – a beautiful sight to see, but it wasn’t the centre of attention. The leopard walking along the road in front of us was though, a big male had decided to take an evening stroll along the tar, much to our delight. That was the best ending to another great day in Kruger. The game viewing is getting better, the watering holes are drying up due to lack of rain, resulting in the animals moving around looking for water. The vegetation is changing so our walks are getting much better because the grass is very short. We saw six big bull elephants along the river bed, during our one walk. We saw a big bull buffalo sleeping in the mud along the Olifants River and about 40 metres away from him there were 3 Black Rhino walking along the river. We saw a hippo mother with her calf, both out of the water and the month’s highlight : a crocodile stealing meat from a leopard who was trying to protect her kill – stuff that belongs only in National Geographic – my guests were stunned !! On one of the days, we got charged by a big bull elephant but we easily managed to get out of danger. We saw a beautiful male leopard lying across the road in full view and very relaxed. We saw another leopard at Shinghamaba dam. There were 2 buffalo between Shinghamba dam and Ngwenya dam, and 2 White Rhino bulls near Campfire. We saw a lioness and her 6 cubs on Marula road and a buffalo herd comes around Tremisana every day. The month of March has been so amazing with sightings around Satara of leopards and numerous lion kills. Around Orpen we were very fortunate with the wild dog sightings. On the 3rd we started the day with about 16 Wild Dogs near Orpen just a few minutes after driving through the gate. They looked very full – they might have had a kill earlier. On our way one of my clients shouted “lion” and we all looked. There was one of the big male lions that live around Orpen walking along the tarred road. It started walking towards the car and stood just right in front of us. That was so amazing : it looked it was like posing for a picture because it moved off after a few shots were taken. 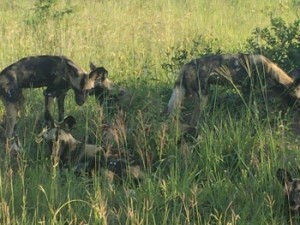 On the 12th the Wild Dogs were there again. They were moving around and this made the guests very happy. We then went straight to the S100 near Satara where we came across cheetah hunting. Owing to the cats’ competition when it comes to hunting, cheetahs are forced to hunt during the day to avoid the other predators. We followed the cheetah as it tried to stalk impalas but it didn’t kill any. We drove back for lunch and afterwards we went back to check on the cheetah and we found it with a kill feeding in some thick bushes. On our way back we found a pack of wild dogs chasing a warthog into the bushes. On the 18th we found a pair of leopards mating. They had made a kill which was on top of a tree. On the 21st‎ we found two lionesses with a male kudu carcass in the river bank feeding on it. There was a male lion lying next to them with a full belly. There was not much to feed on it was the neck left with the spiral horns out still looks amazing despite it being dead. On the 29th we started the day with light rain till midday but we finally got a leopard sighting near Satara. We got a big surprise as the leopard was just in front of Bongani’s open vehicle. It crossed the road into the grass and climbed up a tree. We went to Girivani where there was 4 lionesses sitting next to the watering hole relaxing. Suddenly an impala came running around without noticing their presence and it ran past the pride. The Lions start to like chase it and it was extremely lucky to get away! On our way out we passed other lions close to the road on an impala kill. What a brilliant day !!! Safaris through Kruger National Park this month have been one of the most unpredictable for me so far. I have had days where we have had remarkable sightings, sightings I will never forget and feel so fortunate to experience, however on the other hand I have had some of the quietest days to date. Currently we are experiencing some very abnormal weather patterns. Leading into March should have been coming towards the end of the rainy season, however we have received very minimal rain, which raises concerns for the year ahead. This is the worst year for rainfall in the last 30 years with less than 200mm received. This time of the year we should see flowing rivers, dams full, lush green grasses, but at this early point we are seeing dry riverbeds/dams and the grass already drying out. But we are feeling optimistic that the rains will come……just a little late. 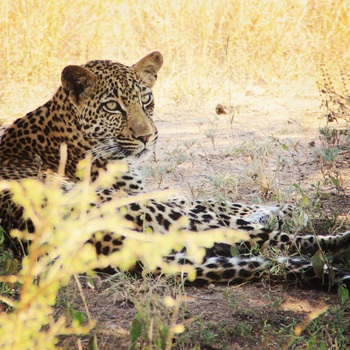 As for the remarkable days in Kruger, well let’s just say it has been a month for the Leopards! I have not had a month with so many leopard sightings for as long as I can remember. Towards the middle of the month it was as if the Leopards wanted to be found, make some very photogenic poses and showing some lovely leopard behaviour. We have had 3 beautiful sightings in the southern routes we take in Kruger. The first was the best of all of them. A mother with her two cubs in a tree situated along the riverbed, the mother was draped over a branch….like most leopards do and her two cubs playing in the tree whilst climbing up and down, up and down. These little cubs were so active and so fascinating to watch so we sat with them for over an hour watching in awe. What’s more incredible about this sighting is we had two male lions literally on the other side of us sleeping under a bush. Yes can you believe it……. Leopards on the left, Lions on the right. This is not a usual situation as Lions and Leopards are very much eternal enemies. They are competition for each other so normally in nature they will be very aggressive towards each other and attempt to kill. Both species were very chilled and we were able to have a fantastic time with these animals in such close proximity. The second sighting was another young female leopard relaxing in a tree on the riverbed. The day had reached temperatures of approximately 40 degrees so this leopard was very inactive. She was happy to chill in her tree with minimal movement. Her pose and beauty made for such a fantastic photo opportunity as her tree was not more than 20 metres from the road. The third leopard sighting was also an amazing find. A very relaxed massive male seeking shade under a tree not more than 4 metres from the road. Our vehicles were the only ones there so we got to enjoy this sighting immensely. Further up to our northern routes I was fortunate with another 2 leopard sightings. The first was from an update we had received that two leopards were not far from us and stationary as they were mating. We responded to the update and made our way there. We could only find one leopard, the male also relaxing in a nice Apple Leaf Tree. It was not a hot day so he too was also quite active. The last of the northern sightings was of another leopard seeking shade on a warm day under a tree again not more than 5 metres from the open vehicle. Our two vehicles had the sighting to ourselves for 20 minutes until we were joined by others. He was a little nervous this leopard so after getting some photos our guests were happy enough to leave the sighting before the leopard got too stressed from all the vehicles. Some other sightings this month in the Kruger involve some very special Rhino sightings, both black and white, breeding herds of elephants crossing the roads in front of our vehicle, and some big dugga boy buffalo booking themselves in for an afternoon mud day spa. The month of March has been so dry. The fact that it has not rained in so long is beginning to worry me a lot. The struggle of the animals searching for water is painful for me. They have to walk miles and miles looking for water. Each day was starting with very high temperatures that as the day progressed you feel like all you can do is sleep. I went home for a couple of days and the day I arrived back our general manager Piero was at the lodge. I went into the office to pass on my greetings. He said I should have arrived earlier because I had missed him doing the rain dance already and it was going to rain. I laughed so much. I honestly tried imagining him dancing up and down the lodge. That very night to my absolute delight it rained heavy rains. I was very pleased and awe-struck. I think from now on we should do the rain dance the whole lodge staff every week, lots and lots of I rain I hope. The rains were a real blessing. 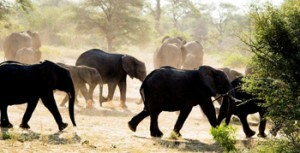 A few days later I saw a herd of elephants that came to the lodge’s watering hole. We were busy having breakfast just after the bushwalk. The elephants stayed around the lodge for quite some time. The guests were very happy that we ended up having a longer breakfast. I have seen elephants a lot of times but I still get excited each time. I keep on taking pictures of them and with each picture I think my love for them keeps on growing. The other day I was busy in the office and I heard a funny sound just outside the door. I went to check out what it was and discovered it was a little squirrel. The little thing looked so fragile. It must have fallen from the thatched roof. I really wanted to keep it has a pet but I am not so sure about the noise let alone feeding it. I kept the squirrel just for the afternoon then I released him back into the garden. Looks like the parents found him and all is well. I am looking forward to the new month. I hope it will have a bit more rain. 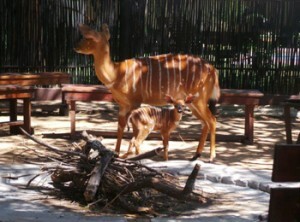 Ronald and our maintenance staff have been busy at Cheetah Inn. After two rather unsavoury experiences letting the premises to would-be lodge operators, we were reluctant to offer Cheetah Inn to any other such chancers. We are very pleased that the African Impact group has leased the premises. What is especially pleasing to me is that African Impact deals mainly with Volunteer Tourism. They have a number of projects that will directly benefit our local communities, something close to my heart. Before we signed the final contract Sandra and I went to one of African Impact’s projects in Northern kwaZulu Natal and were suitably impressed. We look forward to a mutually rewarding association. Ronald was invited to do a helicopter flip over Cheetah Inn and Marc’s Camp. I had allowed a company doing geological surveys to park their helicopter on Cheetah Inn property. 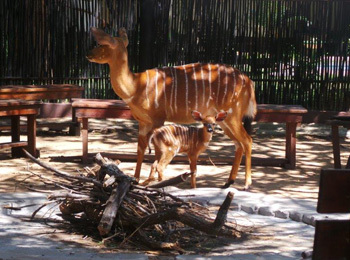 I took the photo of this Nyala ewe and her newborn lamb right in our Boma. The lamb spent 2 nights in the boma and was unfazed by the adoring tourists. VIVA SAFARIS and TREMISANA give you EXCELLENT value for money, with a clean, comfortable and unique room – which, to our delight also had air conditioning! (something which we dread living without in the african landscape!) The bathroom was clean, neat and well appointed, with a shower (that WORKS), a toilet, and basin. The lodge also features unique AFRICAN DECOR pieces, and it suits the surroundings so well, one might think you’re on a movie set! 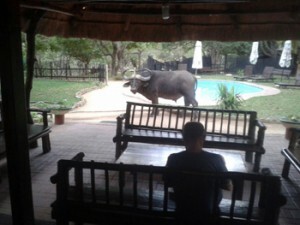 Whenever I felt just a little too secluded from my city life, I ventured to the lobby area, where TREMISANA thoughtfully provides FREE WIFI, so I could reconnect with my social life, and brag about our SAFARI experience! All of the staff, especially the manageress Delina went out of their way to make us feel welcome and at home. Breakfast was a tasty spread, featuring fresh ingredients and a homely feel, and we thoroughly loved the informal dinner BBQ in the bush – a great way to meet the other guests and share the day’s experiences with one another. The gardens are beautiful, with a sparkling swimming pool, the PERFECT place to cool down and unwind after a long day in the bush. TREMISANA LODGE is situated in the BALULE SECTION of the KRUGER NATIONAL PARK, this is a private game reserve, sharing unfenced borders with the KRUGER NATIONAL PARK, and is a part of the NEW GREATER KRUGER NATIONAL PARK, and VIVA SAFARIS provides both morning and sunset game drives, as well as a full day in the Kruger on open game viewing vehicles. Their guides are both friendly and knowledgeable – you really feel like they put their heart and soul into it and are very passionate about what they do. I loved hearing our guide Luke’s stories about the animals and all the things you can learn from their dung and footprints and detecting where they might be. We had excellent sightings and I was able to tick off 4 of the big 5, as well as many other interesting animals (that elusive Leopard, hopefully one day I will actually get to see one on our next Kruger game drive). We would definitely stay at TREMISANA LODGE again and would absolutely recommend the VIVA SAFARIS experience to others. Feb 2015. Party of 4 (two mature couples). Frequent visitors to South Africa, first time to Kruger. Took the 4 day safari. Because there were two couples, we booked the Guest House, which was icing on the cake. Selected this lodge because it is away from a lot of the managed game farms in the south of kruger. Long transfer from J/burg, but well handled with lunches pre-ordered at a very nice midway stop. Stopped overnight in J/burg at MoAfrica for a lovely homely overnight stop at a very reasonable price. Viva collected us at 9.30 the following day. I could write a book about this visit, but suffice to say, the host Kim was brilliant, the lodge is just perfect, clean and food good. Lovely rooms, all the guides were excellent and very knowledgeable. Cannot complement them enough, especially Luke who was our guide through Orpen Gate into the park. To Summarise. Everything we expected and more. Good value, keep it that way, it is bound to attract more business. We all felt that it was well worth the extra travel to get to the natural Bush lands. We have taken safari’s in Kenya and Tanzania, and this was just as good. I stayed at Marc’s Treehouse Lodge on a 4 day 3 night tour. Wish I had stayed longer. The staff was professional and polished and answered all the questions and the accomodation was unique and filled with sounds of the wild. There are tons of wild animals coming around the camp (most are harmless) so its really good value for the money. They give you itineraries at dinner for the following day and all the guides and drivers were very professional and helped when you needed it. I felt the private game drives were as good and wish I had stayed longer. The treehouses have all the modern conveniences *wifi is in the main lodge which is common* and the staff especially Janetta and Margaret provide a ton of color and fill in the bllanks about the areas in and around Kruger. Well worth it and it was a very good deal for the money. I say GO! you won’t regret it. We visited Marc’s camp as part of our Safari package and stayed in one of the tree houses – it was so much fun! Exactly the sort of thing I wanted to do, all the staff were so lovely and the food was incredible too. A real rustic experience, I wish I could have stayed longer! The morning bush walks were great, and the leader who took us round was so lovely. Also the trip into the Kruger National Park was 100% the highlight of my whole trip to South Africa. I went with 3 friends, aged 21-28 but our safari group was made up of people of all ages. I would definitely recommend Marc’s Camp and the Tremisana Lodge to any one, whether it be couples, families or young people visiting with friends, but be prepared for an “al fresco” shower!